Cancer charities said extra NHS staff are 'urgently' needed to help treat the disease. The number of cancer deaths in Scotland increased last year while the overall mortality rate has dropped by 10% over the past decade. NHS figures showed a 16,105 deaths were caused by cancer in Scotland in 2017, up from 15,813 the previous year. While the total number of cancer deaths reached its highest for 25 years, overall mortality rates from the disease have fallen by 10% in the last decade - going from 358 deaths per 100,000 people in 2007 to 321 deaths per 100,000 in 2017. But with more Scots living longer, increasing numbers are developing the disease. Cancer charities are demanding the number of staff in the NHS is increased "urgently" after new figures showed a rise in deaths from the disease last year. Gregor McNie, Cancer Research UK's head of external affairs in Scotland, said: "It's clear cancer continues to have a devastating impact in Scotland. 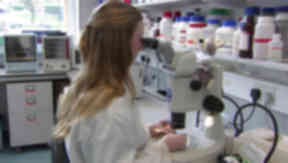 "Thanks to advances in research, new and better treatments are coming on stream which will help more people survive. "Too many people are diagnosed when their cancer has already spread and is harder to treat. If we can diagnose more cancers earlier, it's likely more people will survive. To do this, we need to make sure that people with suspected cancer are offered the right tests." He added: "We know staff shortages are currently having an impact on patients receiving efficient access to diagnostic tests. We'd urge the Scottish Government to urgently progress its plans to employ more people." Five types of the disease - lung cancer, bowel cancer, prostate cancer, breast cancer and oesophageal cancer - were responsible for more than half of all cancer deaths in Scotland last year, with lung cancer killing 4069 alone. While NHS figures showed the overall cancer mortality rate had fallen by 12% for males and 7% for females over the last 10 years, there was a 60% rise in the mortality rate for liver cancer over the period. Death rates for the disease - which is linked to both obesity and alcohol consumption - increased by 47% for men and 93% for women. The figures also showed that cancer death rates in the most deprived parts of Scotland were 76% higher than they were in the least deprived communities.